DestinCondos.com launched in May of 2013 with one simple goal, to connect property owners with people who are excited about visiting the Destin, Florida area. The founders of DestinCondos.com have been visiting this exciting 'hidden gem' for the past 30 years and absolutely love the sandy white beaches, amazing blue water and the great laid back atmosphere one falls into while in Destin, Florida. Finding the condo that is right for you is pretty simple, especially when you use our system to navigate through hundreds of properties in the Destin, FL area to find the one that fits your exact wants, needs and desires. On the Property Owner side we welcome owners, real estate agents as well as management companies. Our site allows you to post condos for sale or condos for rent, whichever fits your exact needs at the time. We've found that by offering you many features and even the ability to instantly upload video and photos of your condo's on the beaches of Destin, Florida you are able to show prospective buyers and renters exactly what you have to offer them. This dramatically increases your booking rate and helps you help others connect with their dream condo in Destin Florida. We are also very proud to have our very own presence right in Destin Florida on the popular HWY 98. 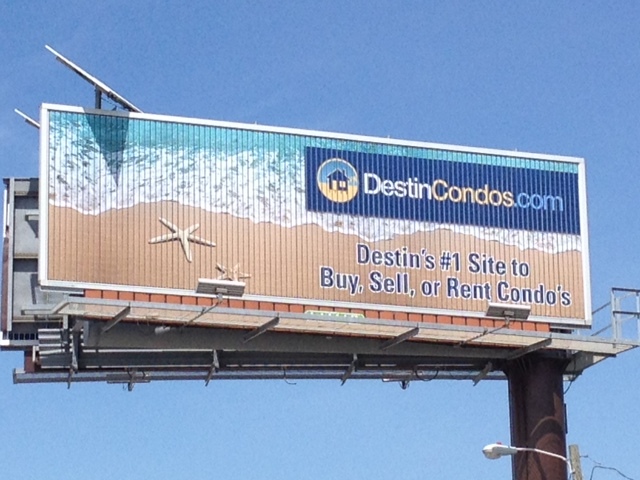 Just look for the big blue DestinCondos.com billboard next time you're on vacation! As you know DestinCondos.com is one of the fastest growing sites on the internet for Owners to rent or sell their property. We would love to update you as we add new features or new things become available that you might find beneficial. We promise to never share your name or email address with anyone.